I have been a nature photographer for a long time. Transferring some of those skills over to graphic design is a relatively new exercise for me. I don’t think of myself as a graphic designer—in my job I have the privilege of working with some very good ones—but when you work in the non-profit world, you find yourself using all the skills you have. 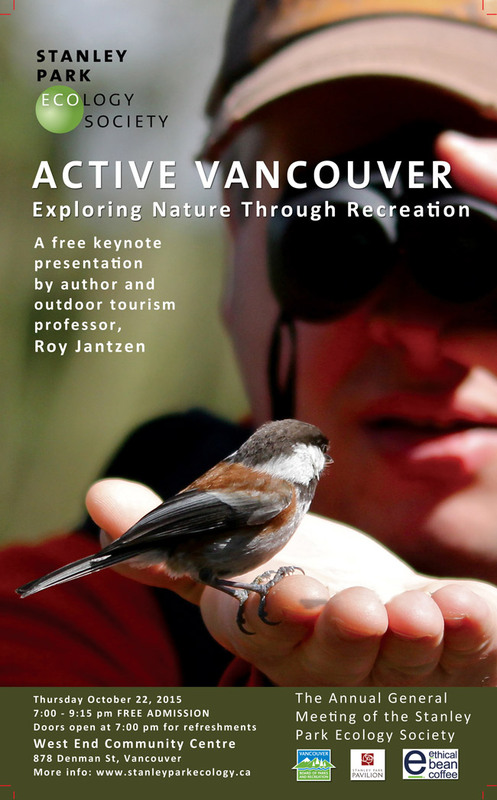 The organization to which I donate a lot of my time, the Stanley Park Ecology Society (SPES), is hosting its annual general meeting this month, and they asked me for some help in putting together an event poster. 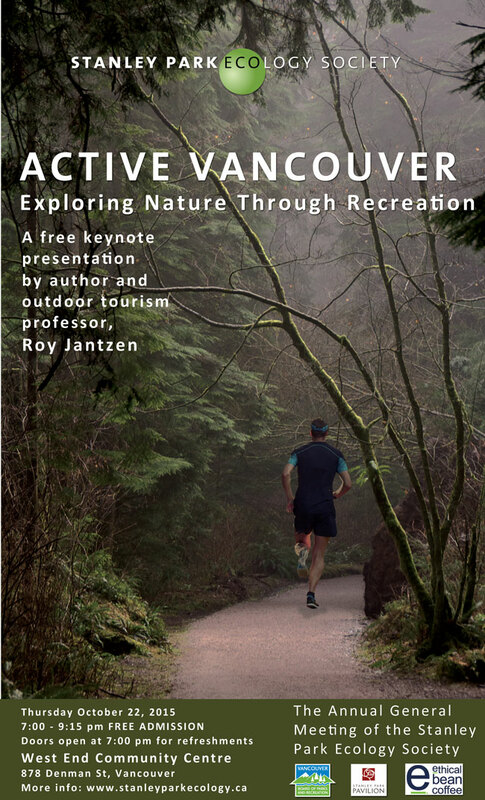 The keynote speaker is Roy Jantzen, who will be addressing the theme of outdoor recreation (cycling, jogging, etc) as a way of connecting with nature. It looks like a really interesting subject, and I wanted to try to make it look as enticing as possible, placing it in the context of the unsurpassed beauty of our park. The client (my friend Patricia, the executive director) loved it; she felt the bright blue sky over Lost Lagoon would really appeal to our community in the dreary weather of late October. 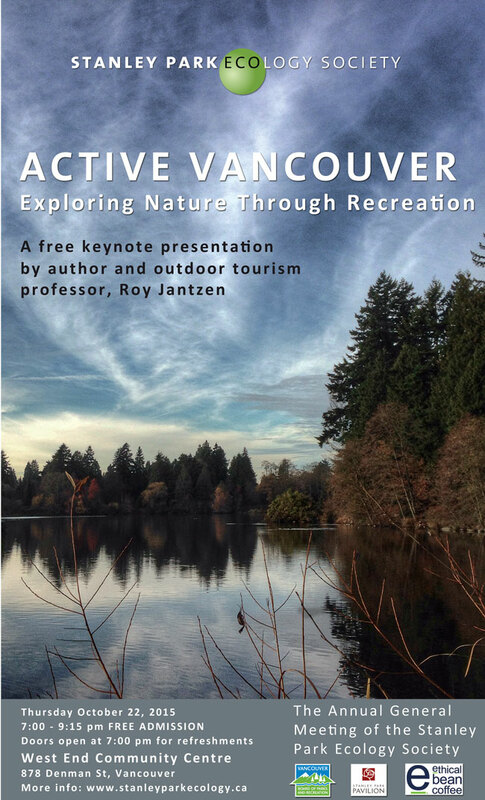 But she tactfully remarked that there was no activity in my Active Vancouver poster. Hmmm, point. I was right chuffed with my design here. I really love the forest setting: it really evokes so much of what Stanley Park is about. Patricia loved it too… but not nearly as much as the happy tones of the previous effort. Third time lucky? For the third draft, I chose a photo that is not my own (the previous two were.) I love Richard Krull’s closeup of a chestnut-backed chickadee perched on a birdwatcher’s hand—it’s a quintessential Stanley Park experience. You can tell by the red crop marks in the corners that this is the one we chose to send to the printer; this was the clear winner in Patricia’s eyes. I’m more than happy with it, and I hope it helps spark interest in the event and in SPES’s work in general. And I’m delighted to be back in the world of graphic design. It has been a while, and I missed it. If you live anywhere in the vicinity of Vancouver’s West End Community Centre, I hope to see you there. Posted in Interpretive Media, Nature, Photography, Visitor Experience and tagged graphic design.